My favorite holidays are the year-end holidays, starting with Thanksgiving and then on to Hanukkah, Christmas, and New Year’s. There’s so much to look forward to during this time. If you’re a foodie like me, there’s the anticipation of new recipes and dining decor to try, not to mention food, glorious food. Tucked in my head and heart are memories of holidays past, from the drop-dead dinners my grandmother used to make (the kind where you wanted to drop dead because you ate too much) to the sweet dinners my first husband and I hosted. Though we were Jewish, we claimed Christmas as our holiday of choice because all the others were taken. Christmas at the Zickermans’ became an annual tradition. And then the holidays changed for me; rather, life changed for me. Just after New Year’s in 1998, when he was only 32 and I was 30, Brett was diagnosed with a brain tumor. We did not yet have children, and now that dream, like so many others, would be put on hold. Though we had no way of knowing his chances for survival (he would live for another six-and-a-half years with many long periods of remission), life became more complicated than the most complex of recipes, including the holidays, which were now laden with meaning and hurt and worry. From then on—and I don’t know why this is so—it seemed as though Brett had a health scare nearly every holiday, which is to say that I spent my 30s feeling sour about the very holidays that had once been filled with hope and promise. This was true even when we had children, delicious girl-and-boy twins born in 2001. The children brought enormous joy into our lives, but now there was so much more at stake. The last Christmas we spent together was in 2003. We had home hospice at that point, and while I can’t remember the details of the day, I’m certain we weren’t in a festive mood. Brett died less than two months later. 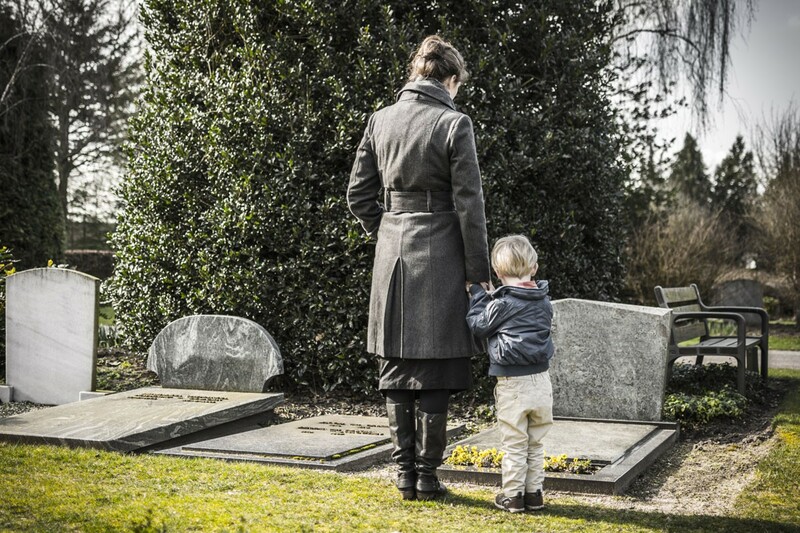 Many months of mourning followed—as expected—and although I no longer had to worry about “when the end was coming,” as I’d done more times than I could count, my worry as a newly widowed mother took on other forms. At no time was this greater than during the holidays. The worry went something like this: What did I have a right to feel? Wasn’t I supposed to be happy? What did I even want for myself and my children? And, finally, how could I give my children pleasing holiday memories when at three years old their world had been torn asunder? None of these questions had immediate answers, and this is true, I imagine, for every bereaved mother because there is no end point to grief; it’s an ache that lives and breathes inside of you. But eventually you reach a place within where you realize that life must carry on and that your job as widow and mother is to help fulfill that vision. You can call it a goal, but carrying on and going forward demands something bigger. There can be no other path but to find ways to bring your loss into the present without letting it dominate your days. Treat yourself with gentleness and respect. What are you physically and emotionally capable of doing? Grief is exhausting, and only you can know how much is too much. Commit to one event, not the four or five scattered parties you attended or hosted in previous years. Conserve your energy. You’ll be better off for it. Engage only in those holiday rituals that you and your family deem most important. What feels right to you? What new rituals might you create? Should gift giving feel like more than you can handle, suggest an alternative. What about an evening out, an overnight getaway, a family hike, a movie, or a lovely brunch? Make a donation in your loved one’s memory to a favorite charity. The amount is irrelevant, but generosity of spirit is contagious. Seize moments of laughter. Laughter heals like no other balm. Watch old Saturday Night Live episodes, read something satirical and silly, or watch America’s Funniest Home Videos on YouTube. I’m serious! Reach out to old friends. Consider this your way of asking for help from the people who know you best, who loved you before your loss, and who will continue to show up in your life going forward. Don’t isolate yourself or your children. Treat yourself. Whether it’s an afternoon at the spa or an afternoon reading magazines in bed, pick at least one treat that is just for you. You’re worth it. Put goal setting and resolutions on the back burner. Right now it’s enough to set some intentions. For instance, how about one bold step each week—one bold move that propels you forward without all the pressure? Remember, love and sadness coexist. Choose to see and feel love, even amid your sadness. When all else fails, remember that Thanksgiving is a day. Christmas is a day. Chances are high that you are more resilient than you know. For more inspiration about how you can live more boldly, follow me on Facebook and Twitter. My life has changed in innumerable ways since that first holiday season alone, but still, we’re in it together. For support from other Solo Moms who’ve experienced loss, turn to our confidential community of Sisters.